There still is one? It's just not as profound we originally expected. I watched the POV again, and it looks like ejector to me. The lead in and out are fairly long because of the speed, the actual radius during the bump is fairly tight. It's kind of deceptive because of the bins. I seriously cannot express how wide this thing is. It has some serious girth to it. Antinos, DelPiero and Lofty like this. 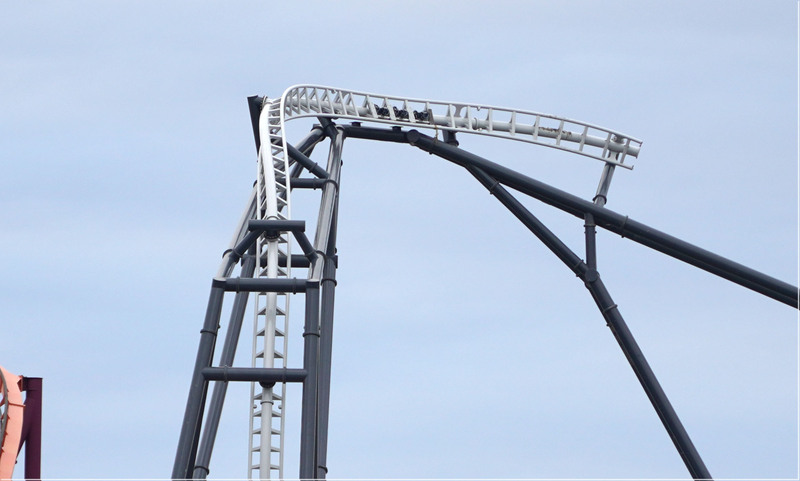 World's Tallest Double Inversion^tm is mostly up. Featuring drive tires at the top just in case it stalls. It's fascinating to look at the differences between this and Steel Curtain from a design standpoint. Good looking supports, consistent crosstie spacing, etc. bernatc22, Coaster Hipster, Hixee and 5 others like this. What are those connectors for right underneath the drive tyre section that attaches to nothing? Maybe a little catwalk? Although, that doesn't really make sense. I think it probably is actually. Do-Dodonpa has one at the top of the loop, although that could just be down to Japanese safety laws. It could also just be generally related to the fact that drive wheels are up there. They would be considered 'regularly maintainable' items, so may necessitate a catwalk for access. That's what I was thinking, but I don't see any more areas to build the catwalk down the rest of the support structure for a ladder up. Maybe they just use one of those basket on extended arm man lifter things or climb the track manually to get up there. I guess we'll find out here soon. Look at this photo, on the very right of the descending support structure looks like what could be attachments for a ladder. Are there any other operating S&S launch coasters besides Do-Dodonpa that have drive tyres in strange places like this? 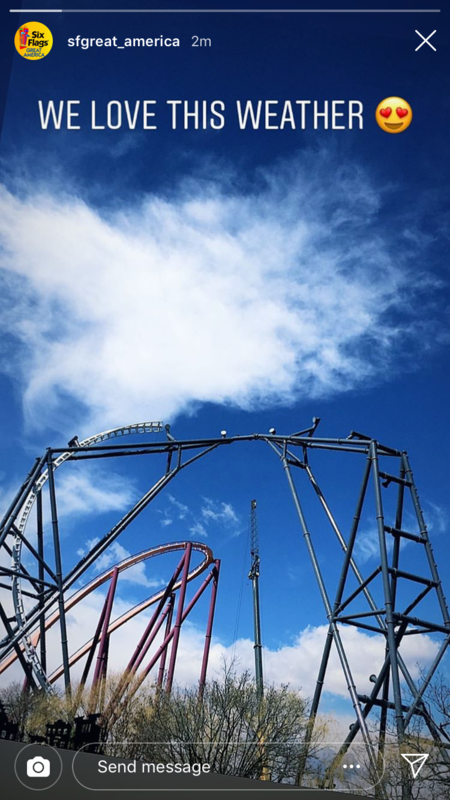 To answer any questions regarding the low sections of the ride...no, it doesn't look like they've been completed yet according to numerous posts on Reddit. They have yet to build the majority of the structure from the exit out of the double inversion all the way to the top of the final dive loop. It does look like they've added some of the low supports, but construction still isn't running at a brisk pace. Hutch, Matt N and GuyWithAStick like this. I popped into the park for about 15 minutes today, and I was awestruck with this thing. It is absolutely massive! You can see it from pretty much anywhere in the park. 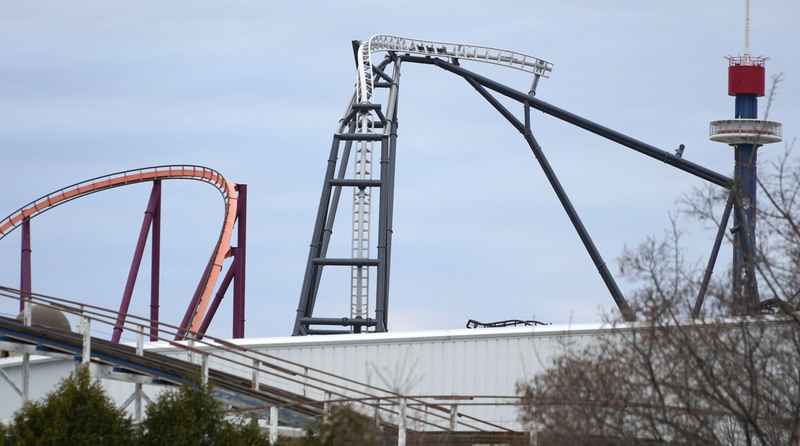 It's no doubt going to be a modern park icon. Hutch and Antinos like this. Video by ABC 7 Chicago. Gosh, that "speed bump" is just pathetic isn't it? Like why even bother. The banana roll thing looks quite striking though. And the turn coming out of that seems like it'll pull some real good g's.